There’s a reason basil is so popular . . . it’s delicious! 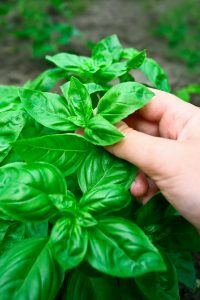 There are many known species of basil, but Ocimum basilicum, also known as Sweet Basil or Genovese Basil, is the most commonly grown. Basils are enjoyed for their rich, spicy flavor with a trace of mint, clove, and even licorice depending on the cultivar. Basil is also thought to have many health-promoting properties and is full of essential vitamins, such as K and A; minerals; and other nutrients. The botanical name of basil, Ocimum basilicum, comes from the Greek words for “smell” and “kingly,” which may allude to its fragrance and the purple (the color of royalty) flowers of many basil varieties. Along with basil’s beautiful fragrances and flavors, basil flowers and foliage are also quite impressive. Some variations, such as Purple Petra, are used as attractive ornamentals in the summer landscape, and to add interest to cut flower arrangements. If you choose to allow your basil to flower, the bees will be flock to it! Basil has few pests and repels quite a few. Japanese Beetles may find it tasty, but basil is said to deter flies, thrips, mosquitos, and ants. 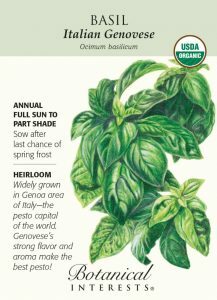 Basil has been used for so long it is difficult to pinpoint its native range; most believe it to be Africa, but it has a long history of legends and employs worldwide. Ancient Egyptians used basil as medicine for snakebites and scorpion stings. Pliny the Elder, a Roman naturalist, recommended basil tea as a remedy for nerves, headaches, and fainting spells. Tradition has it that when a man gives a sprig of basil to a woman, she will fall in love with him and never leave him. Cooking her a delicious pesto dinner with basil would probably work even better! Both the early Greeks and Romans thought the plant would grow only if the gardener shouted and cursed while sowing the seeds. But in present-day Italy, basil is a symbol of love. When to sow outside: 1-2 weeks after average last frost, and when soil temperature is at least 60°F, ideally 65°-85°F. Basil is very sensitive to cold. The seed must have warm temperatures to germinate. Successive Sowings: Basil is best planted in waves, or succession planting at 3-week intervals for a continuous flow of succulent new leaves. Use a lightweight seed starting mix/media (sterile, and lighter than potting mix), and sow seeds 1/4″ deep. Sow 2 seeds per pot, thinning to the most vigorous plant once leaves appear (clip extra plants at the soil level using scissors). The most durable plant may not be the tallest; look for thick, sturdy stems and deep color. By thinning early, you minimize the negative impact of crowding, like stretching for light. Read about more indoor sowing tips. You can use almost any container with drainage to sow basil. Basil seedlings are relatively resilient, and if you wish, you can plant many seeds in a shallow bowl and gently separate them into larger pots once they are about an inch tall and have two sets of leaves. If you start basil in cell packs, you want to “up-pot” them into at least a 3″ pot before transplanting as their roots fill in pots quickly, which causes cells to dry out quickly and restricts growth. 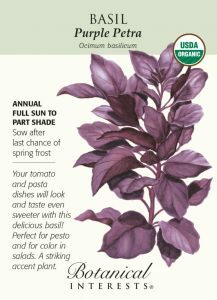 Basil is very frost and even cold sensitive; wait to transplant until nighttime temperatures are above 50°F. Transplant basil seedlings 12″ apart. Basil grows best in well-drained soil that is rich in organic matter. Direct sow two seeds every 12″, thinning to one when seedlings are 2″ tall. If you are growing basil in a container, use a relatively large one to accommodate their fast-growing roots. For example, a one-gallon pot can host 1-3 plants. Keep weeded, as weeds compete with crops for water and nutrients. Unless the soil is very nutrient depleted, do not fertilize basil; it tends to decrease taste. Basil is best harvested before the plant flowers, and the flavor is best when collected in the morning. The young, top leaves taste the best and should be used fresh; the older leaves may be used for vinegar and pesto. Cut a few stems at a time, but never harvest more than 1/3 of the plant if you want it to keep producing.